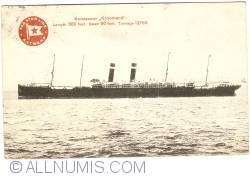 The Red Star Line was an ocean passenger line founded in 1871 as a joint venture between the International Navigation Company of Philadelphia, which also ran the American Line, and the Société Anonyme de Navigation Belgo-Américaine of Antwerp, Belgium. The company's main ports of call were Antwerp in Belgium, Liverpool and Southampton in the United Kingdom and New York City and Philadelphia in the United States. The company operated until 1935 when, due to the economic depression they ceased trading and its assets were eventually sold to the Holland-America Line.